Finally, the last item acquired at the Brimfield antique show back in July. 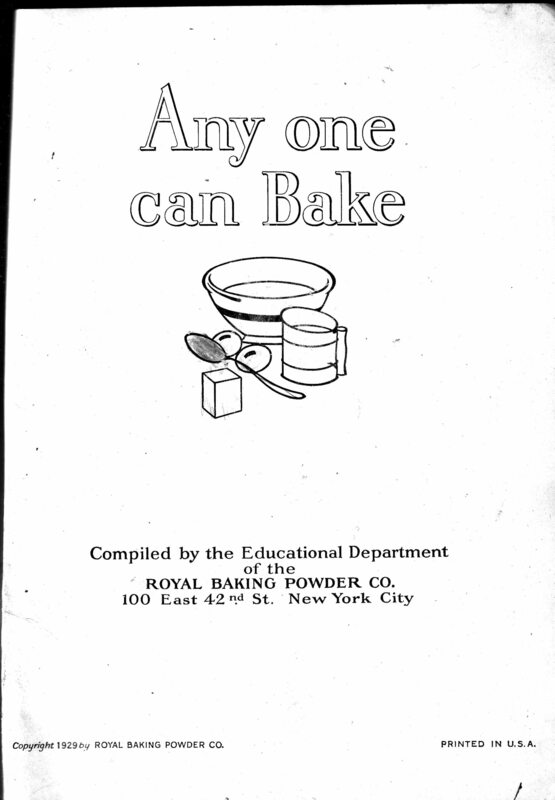 At 1929, this is not the oldest baking powder company cookbook I own (that’s the Ryzon one from 1918), but it is unusual in being a relatively large-format hardcover, six by nine inches. The actual cover has a very faded gold-embossed illustration exactly like the one on the title page, plus an array of food splashes. I’m afraid it’s not in very good shape – I’m going to have to work out how to reattach the cover, one of the pages in the cake-decorating section is missing, and several other pages are loose. And of course, “salted nuts, olives, ices, and sweets complete the formal tea table.” Sounds like fun! Cream the butter and sugar, then add the beaten eggs and flavoring. Mix and sift the dry ingredients and add to the first mixture. Mix well. Knead slightly and roll on floured board to about one-fourth inch thick. Use two pastry cutters of different sizes, also one tiny round cutter, preferably a thimble. First, cut out a large round for the base, then a smaller size for the top. With the thimble, cut three holes from the top round. Spread the large round with jam and over this lay the smaller one so that the jam is visible through the holes. Brush top with a little egg yolk and sprinkle with sugar. Bake in a moderate oven at 385F for about twenty minutes. Makes twelve to fourteen. … I don’t know if I’d want to go to all that trouble for just twelve to fourteen cookies, but they do sound grand!